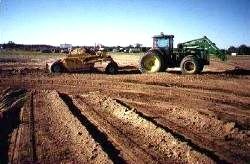 EXCAVATING AND LAND FORMING OPERATION is equipped to handle most aspects of land cleaning, construction of ponds and dikes, and general land forming operations. All land forming equipment equipped with grade eye automatic laser receivers for perfect grade results. Experience in flood channel systems to maximize water using flumes along with pumps and underground irrigation installation.